If you ask me about my favorite Kentucky Restaurants, be prepared for an impressive run-down. We have a lot of wonderful restaurants in Kentucky and I’m always proud and anxious to tell people about the best of the best. Since I call Owensboro Home, Sweet Home, I’m even more proud when the restaurant is right here in the River City. The gorgeous restaurant you see pictured above is one of Owensboro Kentucky’s finest restaurants. This is The Miller House and I can’t wait to give you a virtual introduction. The Miller House, as you can see, looks like a beautiful old house. There’s a great reason for this – it IS a beautiful old house! This quote, as written in the Messenger Inquirer in the summer of 1905, described the plans for the elaborate home of Elmer and Lizzy Miller located at Fifth and Lewis (now JR Miller BLVD). In 1905, Elmer Miller obtained a mold by Sears, Roebuck, and Company to make 1,800 artificial stone blocks for his home. He hauled sand for the blocks up the Ohio River during construction. Referred to as the prettiest and most conveniently arranged in the city, this $8,000 home displayed beveled glass windows, magnificent woods, mantels with tile hearths, and combination of electric and gas light fixtures…. Several changes have taken place over the years. Renovations have been made, ownership has changed hands a few times, and (most dramatically) the beautiful home was hit hard from the tornado of 2007 that tore through our beautiful downtown. Windows blew out and a tree was uprooted – landing on the roof! A lot of love and a lot of pride restored this beautiful, historic home and it shows. 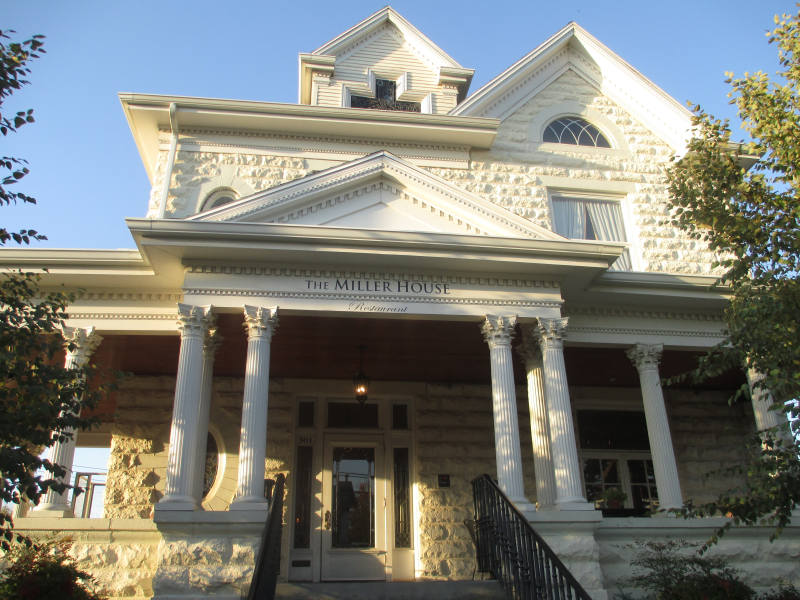 Today, the Miller’s House is The Miller House and it is still a model of beauty and elegance throughout. 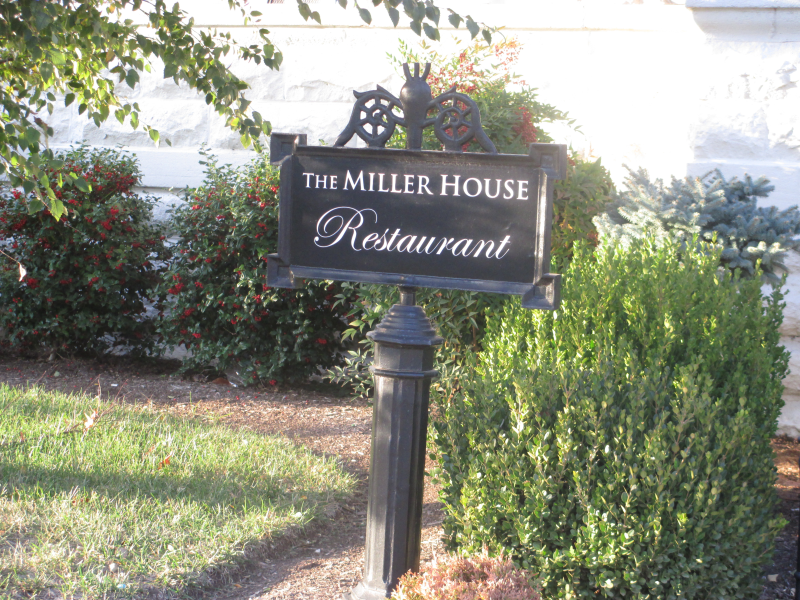 On a recent trip to The Miller House, Michael and I were reminded of just how special this restaurant is. The trip also reminded me of something else: The tone a restaurant sets with its appearance and host/hostess. The Miller House’s tone is set the minute you walk up the sidewalk. The sight of the stately house and meticulously manicured lawn set the stage for what’s inside. As soon as you walk through the doors, you realize that the tone set on the lawn was just the opening act. The interior is so beautiful it stops you in your tracks. 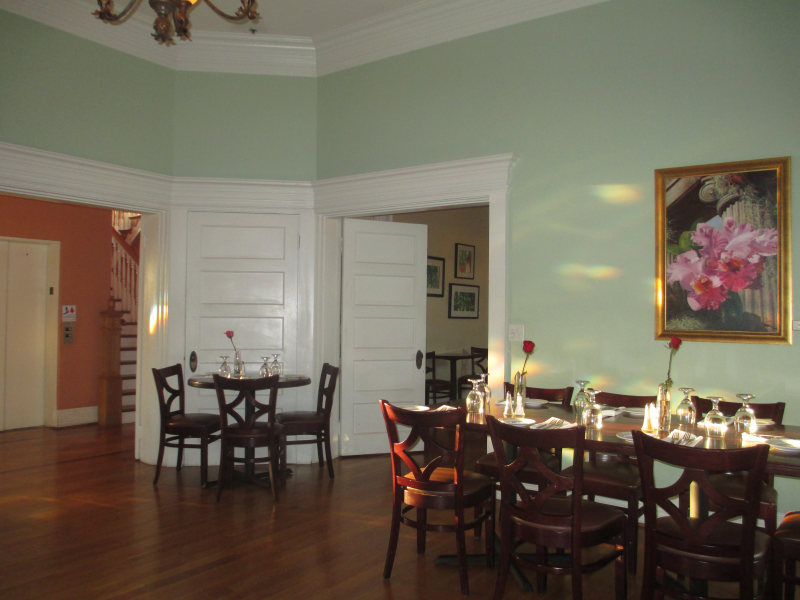 Different rooms of the house are dining rooms. The one we ate in happened to be the original house’s parlor. Because of the layout, diners are able to eat in peace and privacy. The only sound(s) we heard were wonderful songs from the 40’s as they played quietly in the background. I’m over the moon wild about old music, so I was in perfect Heaven. The hostess and server were perfect for the restaurant. The hostess was very warm with a southern charm that fit The Miller House to perfection. Our server, Bryan, was equally wonderful. Incredibly warm, friendly, and – truth be told – one of the best servers we’ve had anywhere. Any time. Friendly, warm, knowledgeable, and an attribute to the entire experience. Many restaurant managers underestimate the importance of their staff. They’ll give their complete attention to decor, menu, Facebook, and promotions and fail to realize their most valuable assets are right there in front of them. 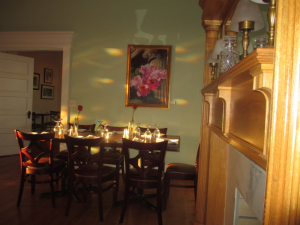 Hosts and servers can make or break a restaurant. They should be chosen carefully and great ones should be treated like gold. If they aren’t great, look for ones who are.… then treat them so well you never lose them! 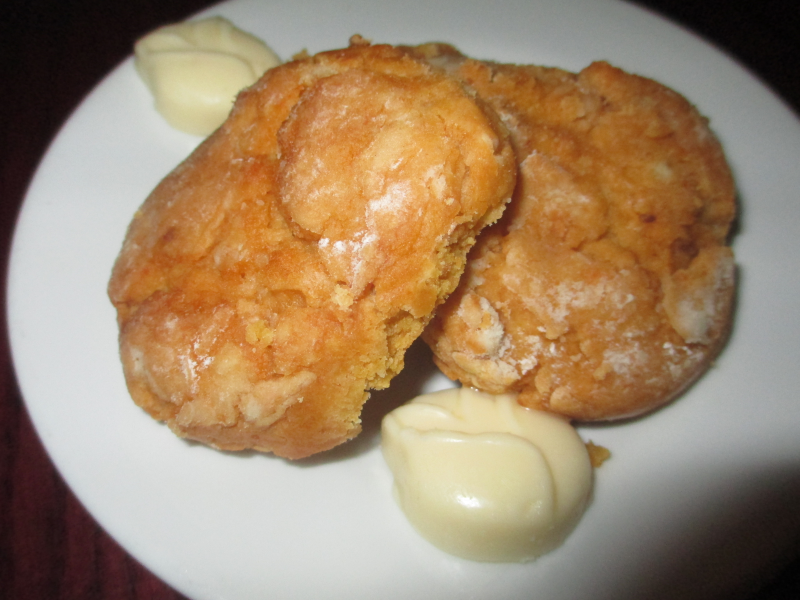 We ordered iced tea (which was amazing, by the way) and were served a plate of Sweet Potato Biscuits and real butter (pictured below). They were ideal for the season (Autumn), very southern, and outstandingly delicious. I love restaurants that serve bread, compliments of the house. When a restaurant does that, I don’t mind the cost of tea so much. Giving your guests Sweet Potato Biscuits and butter simply for visiting you isn’t just beautifully southern, it’s good business. Everyone wants to feel welcome after all. My husband ordered us the Southern Sampler Platter (pictured below) as an appetizer. When I’m going to be writing a review for a restaurant, the more we’re able to sample, the better. And, let me tell you, it doesn’t get any better than the appetizers at The Miller House! Michael’s favorite part of the sampler was the Southern Cheese Torte. I’ll never forget the look on his face after one bite. Or should I say, after each bite. As all cheese lovers know, there’s a huge difference between good cheese and great cheese and you can taste it. Literally. 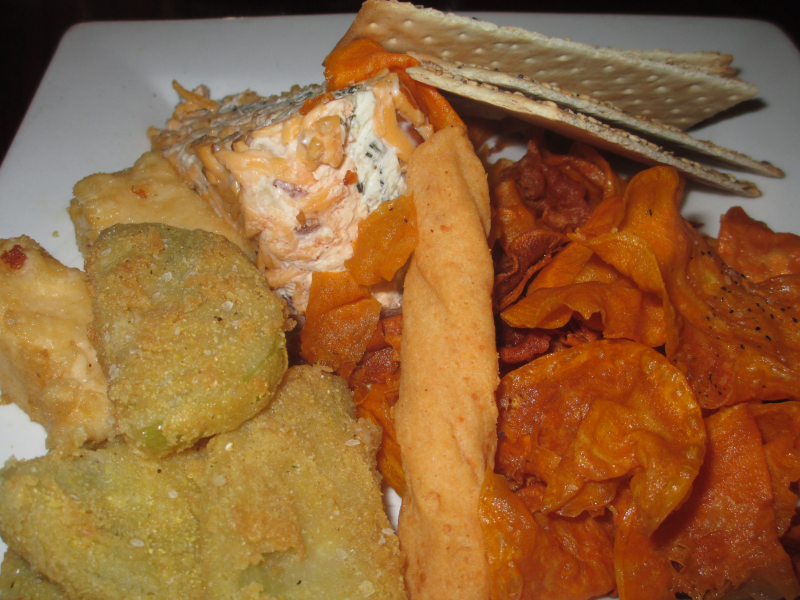 My favorites were the fried grit sticks, sweet potato chips, and fried green tomatoes. A lot of restaurants (with chefs unfamiliar with Kentucky food, I suppose) totally blow fried green tomatoes. I’ve run into a few experiences when I felt like leaving a message, along with the tip: “Please take the fried green tomatoes off of the menu, you’re giving them a bad name.” I haven’t done it yet, but I’ve come thisclose. The fried green tomatoes at The Miller House were perfection. They were coated and fried just right. Not close to right…. not almost there… they were just right. Absolute delicious. I’ve never had fried grits before, but after having The Miller House’s Fried Grit Sticks, I can’t wait to have them again! They were so ridiculously wonderful. They make a fun… and, again… deliciously southern menu item. The Sweet potato chips were also out of this world. I’d say about 4 out of 5 restaurants overcook their house chips. I always wonder how they can’t know that you take them out before they’re brown, not after. Anyway, you don’t have to worry about the people in The Miller House’s restaurant missing a beat. Like everything else, the sweet potato chips were amazing. Personally, I can’ t wait to try their Fried Green Tomatoes with Roasted Red Pepper Coulis and I’m dying to see what they do with Spinach and Parmesan Dip. I haven’t included the prices with the menu items because, over the years, the prices may change. However, click the following link for the prices of the appetizers – I think you’ll be pleasantly surprised. The prices at The Miller House aren’t just fair, they’re shockingly fair. The Main Event: The Meal! I am, as you may know, the biggest catfish fanatic in the world. I danced in my seat when I saw fried catfish fillets on the menu. These outstandingly delicious fried catfish fillets (pictured below) were served with a spicy remoulade that blew my mind. Completely. Just as I was coming to terms with the deliciousness of the catfish and the remoulade, I took a bite of what is (unquestionably) the best coleslaw in the world. It’s more delicious than coleslaw has a right to be and I told it so. My picture is positioned in a way that kind of hides the coleslaw. There’s more of it than appears in the picture and words fail me when it comes to telling you how amazing it is. 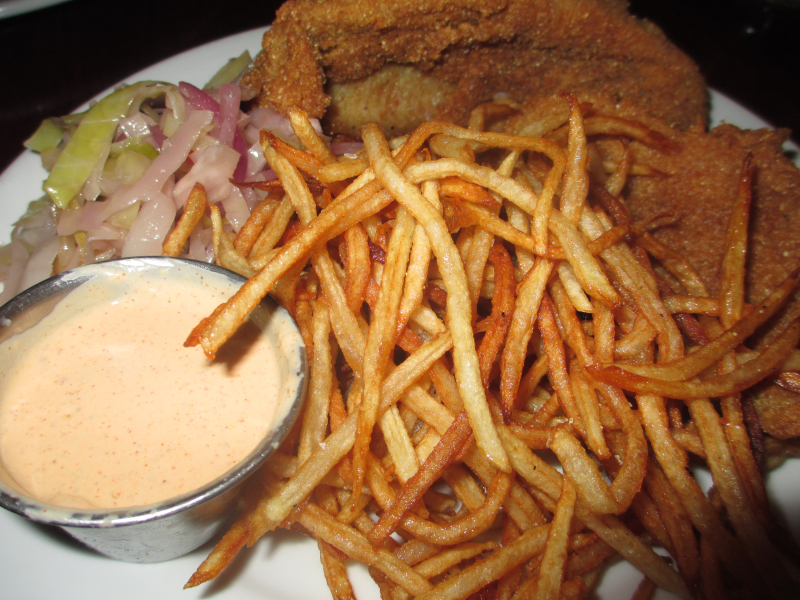 The catfish was juicy, deliciously breaded, and perfectly fried. It was excellent and even more delicious than it looks in the picture. Even the fresh cut fries (also included in the catfish meal) were fantastic! In fact, they might be the best fries in Owensboro…. or Kentucky. Michael ordered the House-made meatloaf with demi-glaze, Yukon gold mashed potatoes and sauteed green beans (pictured below). Each were also amazing. I could have eaten a bucket of the mashed potatoes and could have coated my arm in the demi-glaze and licked it off.I’m certain you couldn’t order anything that didn’t make your jaw drop in The Miller House. You can order a house or Caesar Salad to your meal for just a few dollars more. You MUST check out the Sunday Brunch menu as well. Here, allow me to whet your appetite: Chicken and Waffles, Stuffed French Toast, Fried Catfish Fillets, Breakfast Hash, The Miller House Breakfast (Two eggs cooked your style and served with bacon or sausage, cheddar grits or hashbrown casserole and biscuit or toast), biscuits and gravy, Steak and Eggs, Southern Eggs Benedict, Southern Fried Chicken Salad, and a lot more! Now they’re just showing off. If you’re looking for one of the best restaurants in Kentucky, you now know its name. 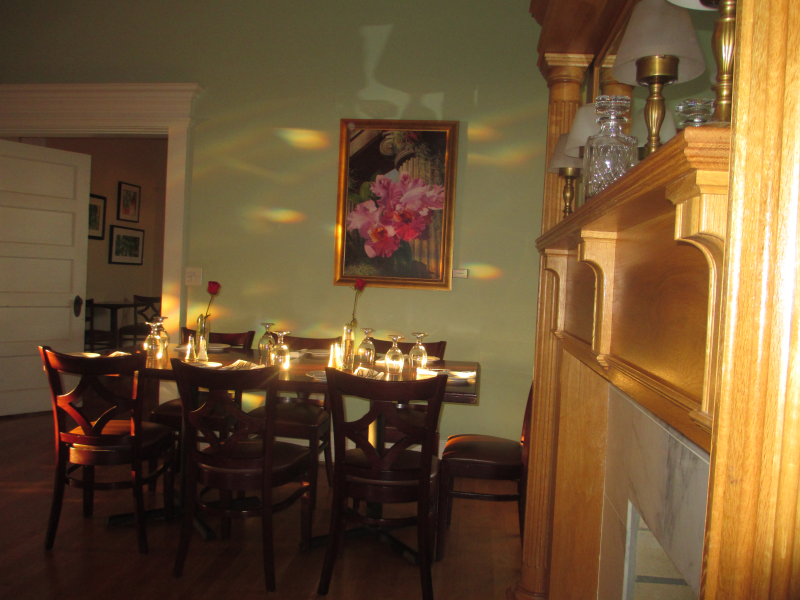 Dinner 5:00 p.m. – 10:00 p.m.
Bar 4:00 p.m. – 12:00 a.m.
To make a reservation, give us a call at 270-685-5878! The Miller’s would be so incredibly proud.